When the ordinary business card is not enough! 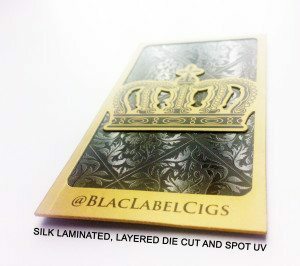 Double thick silk laminated cards is here. There are all sorts of reasons why you might be interested in getting some business cards of your own. For example, if you are attending a social function, a business card is a simple but nonetheless reliable tool for handing out your contact information while maintaining the conversational momentum that is so crucial for successful rapport-building. Similarly, if you want to distinguish yourself from your competitors in the first step of your efforts to build a personal brand, there are few tools that can match the remarkable cost-to-benefit ratio of the humble business card. to remember that a business card cannot succeed unless it can convince the recipient to take a second look at some later point in time. In part, this will be dependent on your ability to make the right impression on your new contacts. However, it is also worth mentioning the power of a premium business card, which is where we can come in. In short, our premium business cards are not the simple pieces of paper that come to mind for most people when the concept of the business card is brought up. Instead, each one consists of two sheets of silk that have been layered together to create more customization options than otherwise possible. For example, the extra thickness makes it possible to emboss both the top and the bottom of the business card for visual effects that stand out to the senses. Similarly, foil makes it possible to emphasize particular parts for increased impact, while die cutting makes it possible to cut intricate designs even into the most delicate materials. Other customization options include but are not limited to spot UV, round corners, and painted edges, meaning that you can customize our premium business cards to your heart’s desire. Of course, no mention of the customization options for our premium business cards would be complete without bringing up our full color printing, which make it possible to print beautiful patterns in a stunning selection of bold and brilliant colors. Combined with the other finishing touches that can be lavished onto them, full-colored printing ensures that our premium business cards can be as creative as they need to be in order to capture and captivate the senses while still looking as professional as possible. In this way, they can not just complement your social networking abilities but also augment them, thus making them that much more valuable than their lesser counterparts. Finally, while not as exciting as all of the customization options that have been mentioned here, it is worth mentioning that our premium business cards’ 32pt thickness also makes them remarkably sturdy. In fact, they are not just resistant to simple wear and tear but also to the water that can reduce most business cards to smeared messes with minimal exposure, meaning that there is absolutely no chance that their recipients will lose your contact information through a moment’s carelessness. Summed up, if you are in need of a business card that can stand out among the competition out there, you have a perfect solution in the form of our premium business cards, which let you express the fullest extent of your creativity. For more information about our printed products as well as other topics related to printing in Miami, please contact us at your earliest convenience.